Polish statesman and landlord of the eighteenth century; a descendant of one of the oldest families of Lithuania and Samogitia, and one of the most enlightened members of the Diet assembled in Warsaw from 1788 to 1792. "And after all this, you demand from the Jew that he shall be useful to the country which does not profess to be his father-land, that he shall be faithful and devoted to those who constantly oppress him! The Jew did not take to agriculture, because he did not care to exchange one kind of misery for another; the law would not permit him to own land, and he had no desire to become a serf and to work for others. He showed strong inclinations to trade and industry; but the towns either would not admit him at all to these pursuits, or at best allowed him to be only a haberdasher. It was a constant struggle between the Jews and the Christian merchants: and therein lies the cause of the decay of trade and the impoverishment of the towns." When the Diet appointed, in June, 1790, a committee "to reform the condition of the Jews," But-rymowicz was one of its most active members. 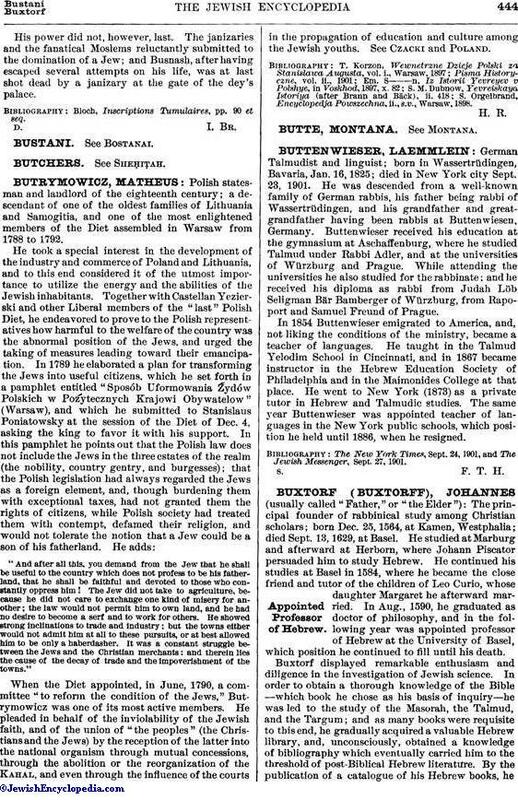 He pleaded in behalf of the inviolability of the Jewish faith, and of the union of "the peoples" (the Christians and the Jews) by the reception of the latter into the national organism through mutual concessions, through the abolition or the reorganization of the Kahal, and even through the influence of the courts in the propagation of education and culture among the Jewish youths. See Czacki and Poland. S. Orgelbrand, Encyclopedja Powszechna, ii., s.v., Warsaw, 1898.